This is the final blog entry in the ‘Schlichter Files’. Pretty soon, this website will be taken offline. I would like to take this opportunity to thank all my readers for following my commentaries, essays and occasional rants over the past two-and-a-half years. Thank you. In the past few years, Detlev has made a spectacular contribution to Austrian School economics in the UK. 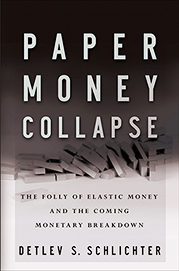 When I first found his book Paper Money Collapse: The Folly of Elastic Money and the Coming Monetary Breakdown, I knew I had found the contemporary Austrian analysis I was looking for. I was delighted to endorse it. That giant intellectual contribution to our economic circumstances has been complemented by Detlev’s unique ability to explain his ideas with a compelling charm from the perspective of experience. I will never forget his astonishing appearance on Radio 4’s Start the Week. We wish Detlev all the best as he moves on to new enterprises, just as we wonder how to fill the vacuum he will leave. We’re delighted to host his articles and we hope one day to welcome him back to the sphere of ideas.